In this blog entry AG Trainer Barbara Wetzel shares tips on how to create lifelike restorations with the usage of the Zolid Green-State Finishing Kit, which can be used for Zirconia, such as the Zolid DNA Generation zirconia, and CoCr sinter metal restorations in the white / green state. Some of the tools in the set is also suitable for finishing veneer ceramics. This allows easy creation of true-to-nature details such as surface structures and textures. The polishers in the disc and garnet shapes can be used for soft smoothing of the connectors or for gentle thinning of the crown margin (fig.4 / fig.5). The use of rubber rollers is not recommended for CoCr sintering metals, such as Ceramill Sintron. Even if liquids are subsequently used in the processing of zirconium oxide, strong polishing of the surface should be refrained from. 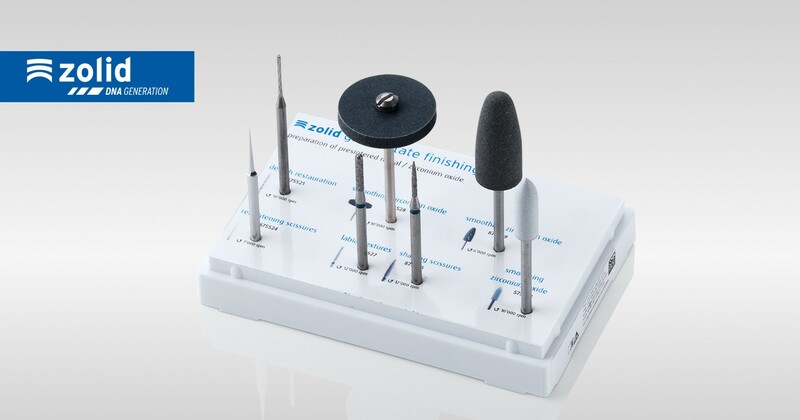 By using these tips and a set like the Zolid Green-State Finishing Kit, which covers all the tools you need for the refinement of materials in the green/white state, you can create restorations with the extra demand in natural aesthetics. See also the blog entry "5 tips for the handling of dry millable CoCr sinter metal" for more advice on metal.